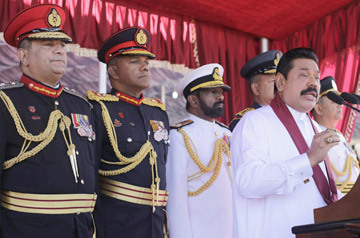 President Mahinda Rajapaksa called upon all countries to join hands on the path to democracy, development, national freedom and the strengthening of human rights. He pointed out that if terrorism was not eradicated in 2009, children in the North could not have attended school or entered universities freely as they do today. “But today, people in the North enjoy wide-ranging freedom. You can see this when you visit the North. We, Sri Lankans who were born in this country, were brought up in this country and live in this country have every desire to protect the peace and unity of our country much more than any others from outside. We have to recall the bitter memories of the past because baseless allegations are levelled against us,” the President said. 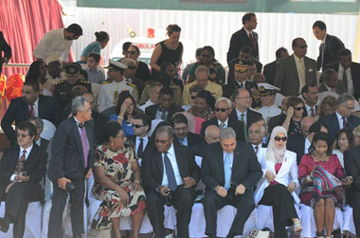 President Rajapaksa said nobody expected, eight years ago, the development seen today. “Even the most vehement foreign critics have acknowledged the wonders of this infrastructure development. We are rapidly progressing: from war to peace, from inefficiency to efficiency, pollution to cleanliness, un-development to development and slavery to freedom”. 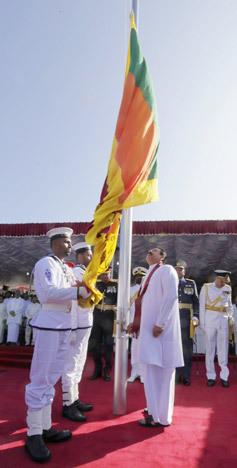 “We have unfurled the National Flag today to mark the 66th anniversary of Independence, when the whole of Sri Lanka enjoys freedom. History records that where we are gathered today has links to several important places of our independence. Temples and monasteries dating back to the era of King Devanampiyatissa, more than 2,000 years ago, are also found in this region. King Vijayabahu, who liberated the Motherland from the Chola invaders was protected here. Further, Prince Yatalatissa, son of Mahanaga, was born at Yatahalena here. He was succeeded by Gotabhaya, father of Kavantissa, the father of our great King Dutu Gemunu. That is not all. The Kingdom of Sithavaka Rajasingha was also situated in the Kegalle district. Hence, the holding of this Independence Day celebrations in Kegalle is all the more meaningful. When the Mahinda Chinthana was endorsed by the people of this country in 2005, to usher in an honourable peace to our Motherland, the people of Sri Lanka did not have the freedom to travel to one-third of the country. The Tigers were in forceful occupation of two-thirds of the coastline of the country. Not only the unity of the country, but also the economy was almost in its deathbed. Freedom means responsibility. Yet, previous governments were not prepared to shoulder the responsibility of liberating the country from terrorists or building the economy. There were airlines, gas companies, estate houses and insurance companies. We have given them to people's ownership. We took the responsibility of building highways and a modern roadways network, new ports, a new airport and became the only Asian country to provide 24-hour electricity to the entire country. We also took efforts to bring the rural environment to the city and the development of the city to village, as you can see here. We have also carried out the important responsibility of solving the unemployment problem by providing state employment to hundreds of thousands of graduates. We have brought development to the village and made us self-sufficient in rice by building tanks and reservoirs. We took the important decision that hundreds of thousands of youth who are unable to join universities should be provided bilingual education and taught subjects such as science and technical subjects, and given vocational training. Nobody expected, eight years ago, the development seen today. For the first time, we hosted a Commonwealth Heads of Government Meeting and showed to the world how we developed the country, making use of the peaceful environment and the reconciliatory attitudes of our people. Even the most vehement foreign critics have acknowledged the wonders of this infrastructural development. We are rapidly progressing: From war to peace, from inefficiency to efficiency, from pollution to cleanliness, from under-development to development and from slavery to freedom. When we defeated terrorism and won freedom for the people in the South, we said that it was our responsibility to make it a greater victory for the people in the North. Nobody came forward to give the freedom to the people of the North that they enjoy today. When their human rights were violated, there was nobody to restore them. Only we were concerned about it. Nobody raised the issue of human rights when the former Opposition Leader Amirthalingam, Sam Thambimuttu, Minister Lakshman Kadirgamar and Rajiv Gandhi of India were assassinated. Before 2009, every family in the North had to provide a member to the LTTE. Thousands of children of school-going age were forcefully recruited to the LTTE. The children returning home from school were forcefully dragged away to LTTE training camps. The LTTE grabbed the subsidies sent from the South to the North. 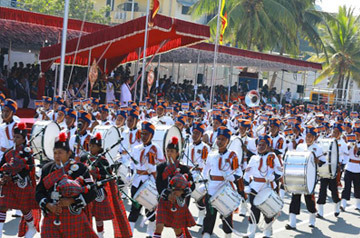 The LTTE even levied a tax on celebrations held for a girl's attainment of age. A family was not allowed to leave Kilinochchi together for any purpose. On pay day, the LTTE waited near the Kachcheriya to grab money, a portion of the government employees’ monthly salary. They also forcibly used Northern civilians to build bunkers. Where did these people come in search of their freedom? They came to the midst of the Sinhala community. 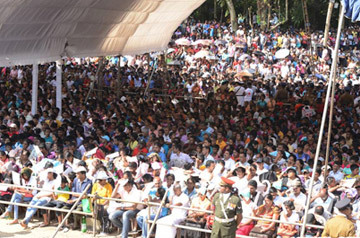 Places such as Kollupitiya, Bambalapitiya, Wellawatta, Modera and Mattakkuliya in and along the suburbs were full of the people who came in search of peace. If we did not eradicate terrorism in 2009, children in the North could not have attended school or entered the universities as freely as they do today. But today people in the North enjoy wide-ranging freedom. You can see this when you visit the North. Three decades of suffering ended on May 19, 2009. Since then, there has been no bomb explosion or shooting by terrorists: And no white flags of mourning in our villages. It is necessary for the people in the North to be aware that certain foreign forces are attempting to use them as human shields. The invaders always came to our country, shedding oceans of crocodile tears. They interfered in these countries, putting forward claims to protect human rights, establish democracy and the rule of law. Every powerful country should realise the difficulty in defeating terrorism. What we faced was a more serious and brutal challenge than they ever faced. The difference between them and us was that we instructed the Security Forces to give the highest priority to protect the lives of civilians. Those powerful countries took 50 to 100 years for reconciliation after civil wars. We have to ask the world whether there is any country that has progressed so much on the path of reconciliation in just four years. We see the use of information provided by those who are committed to separatism and those who were defeated by the people to level charges of war crimes and other alleged offences against Sri Lanka as a grave offence. I see the attempts to level charges of war crimes against us in Geneva today as the triumph of those who are not in favour of peace. This seeks to drive fear into people and nations committed to peace and working to safeguard a country's independence and freedom. These are not founded on peace, fair play or justice. We categorically state here that we are not ready, under any circumstances, to deprive our country of the freedom we have won. We Sri Lankans who were born in this country, were brought up in this country, and live in this country, have every desire to protect the peace and unity of our country much more than any others from outside. We have to recall the bitter memories of the past when baseless allegations are levelled against us. Bitter memories should be written on sand as they get wiped away. Good experiences should be etched on stone to be remembered forever. We know what should be written on sand and forgotten and what should be etched in stone and remembered. Forgetting these bitter memories, we have pardoned the terrorists who came to kill us and rehabilitated them, providing employment for some of them in the Police and the Civil Defence Corps and provided them with suitable livelihoods.Revenge has never been a part of our culture. We have acted to provide justice through the law by defeating terrorism and curbing underworld gangs of the South. Our fundamental thinking is not to introduce laws that are not considered necessary while protecting the laws. Instead of bringing new laws, we ended the State of Emergency that lasted for 30 years. Whatever obstructions caused by the media when we were battling terrorism, we did not censor the media. We even opened the door for some anti-peace and anti-national media institutions who were not allowed in other countries. We continue to follow the policy of ‘Eva, balava’ (Come and see). The public opinion from all parts of the country including the North, East, South and West are reflected in elections to the lowest democratic bodies to the presidency, as seen in elections we held to Pradeshiya Sabhas and Provincial Councils, general elections and Presidential elections. We should keep in mind that our contest is not among blue, green, red or yellow parties; or Sinhala, Tamil, Muslim and Burgher communities. Our contest is between those who love this country and those who have hatred towards it. People in our country who belong to all religions and speak different languages are moving together in unity and strength towards reconciliation and development. With utmost goodwill, I call upon all countries to join hands with us on the path to democracy, development, national freedom and the strengthening of human rights. In speaking to you on Independence Day last year, I quoted some words of the Buddha. I will recall this today. The Buddha gave a valuable lesson to the Brahman, Ambetta, based on a female bird named ‘keta kirilli’ commonly known in villages as Gomariththa (common wagtail). This means the keta kirilli too should have the freedom to live as it wishes in its nest.